Playing outdoors is one of the highlights of summer-time. Whether you’re at the park, a backyard BBQ, swimming, hiking, working in the yard or just soaking up some vitamin D, the likelihood that you’ll spend hours in the sun is high. As a society, we’ve become more aware and hyper-vigilant about guarding against sun exposure by increasing our sunscreen usage and protecting our skin with hats and long sleeves. But there are other risks posed by time in the sun, including dehydration, heat stroke and heat exhaustion. The body needs water to function. Dehydration occurs when water loss exceeds water intake. Dehydration can happen with as little as 1%-2% loss of your ideal water content. The average person loses 90 ounces of water each day. It’s important to recognize the symptoms of mild dehydration and treat them immediately so they don’t become more serious. 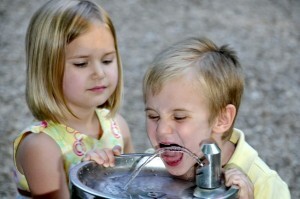 Dehydration can lead to heat exhaustion and heat stroke. Heat exhaustion is the precursor to heat stroke. Dehydration, heat exhaustion and heat stroke can all occur indoors as well as out-of-doors. Symptoms of heat exhaustion include: dizziness, muscle cramps, profuse sweating, headache, nausea and vomiting. Heat stroke occurs when the body’s core temperature is elevated drastically. It is a form of hyperthermia. Heat stroke can be fatal. When symptoms set in, cooling the victim is the first critical step. Increase your fluid intake, even when you’re not feeling thirsty. Water is best, but sports drinks, smoothies and coconut water are also beneficial. Take frequent breaks when hiking, playing and exercising. Avoid vigorous exercise during the heat of the day. Stick to the shade as much as possible. Wear lightweight, loose-fitting, light-colored clothing that wicks moisture away from the body. Avoid sunburns by wearing sunscreen. Dehydration, heat exhaustion and heat stroke are serious risks anytime you spend time in the sun, but they don’t have to stop you from enjoying the summer. Awareness and prevention are more than half the battle. Be safe, be smart, and have fun!